"When I became your prime minister, the United Kingdom had just voted to leave the European Union. "From my first day in the job, I knew I had a clear mission before me - a duty to fulfil on your behalf: to honour the result of the referendum and secure a brighter future for our country by negotiating a good Brexit deal with the EU. "Throughout the long and complex negotiations that have taken place over the last year and a half, I have never lost sight of that duty. "Today, I am in Brussels with the firm intention of agreeing a Brexit deal with the leaders of the other 27 EU nations. "It will be a deal that is in our national interest - one that works for our whole country and all of our people, whether you voted 'Leave' or 'Remain'. "It will honour the result of the referendum. "We will take back control of our borders, by putting an end to the free movement of people once and for all. "Instead of an immigration system based on where a person comes from, we will build one based on the skills and talents a person has to offer. "We will take back control of our money, by putting an end to vast annual payments to the EU. "Instead, we will be able to spend British taxpayers' money on our own priorities, like the extra £394 million per week that we are investing in our long-term plan for the NHS. "And we will take back control of our laws, by ending the jurisdiction of the European Court of Justice in the UK. "In future, our laws will be made, interpreted and enforced by our own courts and legislatures. "We will be out of EU programmes that do not work in our interests: out of the Common Agricultural Policy that has failed our farmers, and out of the Common Fisheries Policy that has failed our coastal communities. "Instead, we will be able to design a system of agricultural support that works for us, and we will be an independent coastal state once again, with full control over our waters. "EU citizens who have built their lives in the United Kingdom will have their rights protected, as will UK citizens living elsewhere in the EU. "A free trade area will allow goods to flow easily across our borders, protecting the many skilled jobs right across the country that rely on integrated supply-chains. "Because our European friends will always be our allies in the fight against terrorism and organised crime, the deal will ensure that security co-operation will continue, so we can keep our people safe. 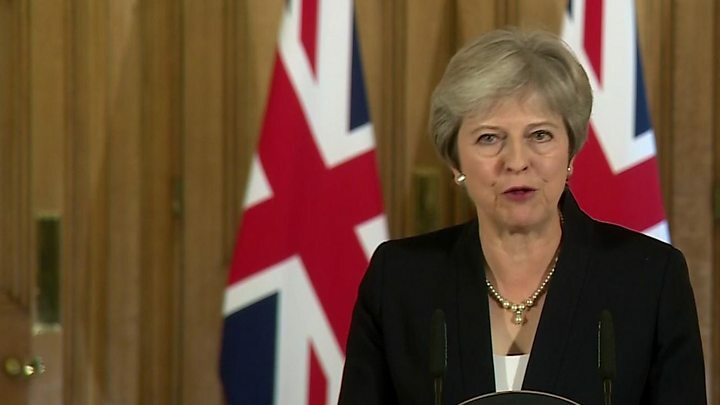 "As prime minister of the United Kingdom, I have from day one been determined to deliver a Brexit deal that works for every part of our country - for England, Scotland, Wales and Northern Ireland, for our Overseas Territories like Gibraltar, and also for the Crown Dependencies. "This deal will do that. "Crucially, it will protect the integrity of our United Kingdom and ensure that there will be no hard border between Northern Ireland and Ireland - so people can live their lives as they do now. "It is a deal for a brighter future, which enables us to seize the opportunities that lie ahead. "Outside the EU, we will be able to sign new trade deals with other countries and open up new markets in the fastest-growing economies around the world. "With Brexit settled, we will be able to focus our energies on the many other important issues facing us here at home: keeping our economy strong, and making sure every community shares in prosperity; securing our NHS for the future, giving every child a great start in life, and building the homes that families need; tackling the burning injustices that hold too many people back, and building a country for the future that truly works for everyone. "On 29 March next year, the United Kingdom will leave the European Union. "We will then begin a new chapter in our national life. I want that to be a moment of renewal and reconciliation for our whole country. "It must mark the point when we put aside the labels of 'Leave' and 'Remain' for good and we come together again as one people. "To do that, we need to get on with Brexit now by getting behind this deal. "Parliament will have the chance to do that in a few weeks' time when it has a meaningful vote on the deal I hope to strike today. "I will be campaigning with my heart and soul to win that vote and to deliver this Brexit deal, for the good of our United Kingdom and all of our people."